The adventurous pilgrim's guide to exploring the world with the Saints. 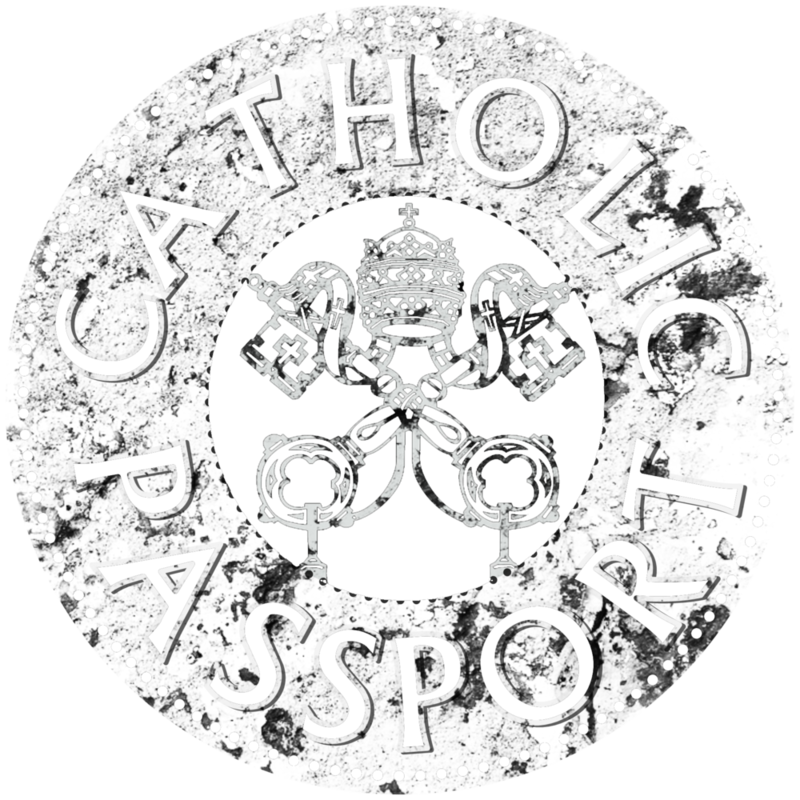 Catholic Passport is a place for you to dream, explore, follow, and plan a Catholic pilgrimage. Let's journey together to learn more about the Saints, pilgrimage sites, and prayers that enrich our faith. Where should Rose go next? See where Rose went on her 2018 summer pilgrimage! Scroll through the itinerary to follow her journey. Hover and click to learn more about each pilgrimage site. Today Rose departs her beloved St. Paul, Minnesota, for a fifty day adventure with nothing but a small backpack. She is accompanied only by the Holy Spirit and her friends the saints. She takes with her the prayer intentions of family and friends. Rose arrives in Paris for the first stop of her adventure! Notre Dame, Sacré-Coeur, and Rue de Bac are on the list, but jet lag may demand some extra rest. This is Rose’s first time in France, where she will focus her itinerary on St. Thérèse. Rose drives to Chartres, France, to gaze at the beautiful stained glass in the famous Cathedral de Notre Dame. Chartes has been a place of pilgrimage since the 12th century and Rose has wanted to go here since her art history classes in high school. That same day, she'll see the city of Alencon, where St. Thérèse was born. Maybe she’ll enjoy a croissant on the bridge where Sts. Louis and Zelie met in 1858. Rose has been looking forward to this day for many years! When St. John Paul II declared Thérèse of Lisieux a Doctor of the Church in 1997, Rose was in the process of selecting a confirmation Saint. Or was it St. Thérèse who decided to select Rose? Either way, their friendship continues to grow, so it was about time to travel to her home! Rose will pray at the Carmel, Les Buissonnets (Thérèse’s childhood home), and the Basilica. There are very few people in the world who know that Fabriano is the resting place of St. Romuald. Rose is one of them. Not many people seek his intercession, so Rose is pilgrimaging to his tomb and pressing into the silence and solitude of Camaldolese spirituality. You may be wondering why anyone would ever want to visit Camaldoli, Italy. You've probably never heard of it before. But it's a very special place for Rose! June 19 is the anniversary of Rose’s baptism and it happens to be the feast of St. Romuald, the founder of the Camaldolese. She couldn’t think of a better place to be on this day. Today Rose heads to Florence for a day full of art and beauty in Tuscany. She will visit Santa Maria del Fiore, the Convent of San Marco, and other art galleries. Rose has visited Rome, the heart of the Catholic Church, several times before. The first stop on the list is to pray for her students and colleagues at the tomb of St. Agnes, the patron of her school. Naturally, Rose's first stop in the Holy Land will be the town of Nazareth. This is where Mary said yes to becoming the mother of Jesus. St. Joseph cared for the Holy Family here and Rose will join them today as she ponders the hidden life of Jesus. Rose will go in haste to the hill country to the Church of the Visitation in Ein Karem, near Jerusalem. Rose grew up at Visitation parish in Minneapolis, so this place has been near to hear heart for many years. The site of Jesus' birth is quite near the place Mary spent her much of her pregnancy, in the house of Elizabeth. Yet to visit Bethlehem, Rose will cross over into Palestine. How many Christmas carols will she sing today? She’s hoping to meet some shepherds and angels, too. Next Rose will return to Galilee to Kafr Kanna, the site of the Wedding Feast at Cana. She’s hoping she will be invited a wedding there, but if not, she’ll definitely enjoy some water, then wine. Just hanging out on the Sea of Galilee on this feast of St. Peter and Paul. There is a solemn Mass in the evening in Tiberias to celebrate the gift of these Apostles. Today Rose will go up the mountain with Jesus. She won’t pitch a tent there, but looks forward to reading the story of Jesus’ Transfiguration at this site. What better place to be for the Feast of the Most Precious Blood of Jesus than Jerusalem? Rose will spend the day praying at the Basilica of the Agony, Mount of Olives, and Gethsemane. The archeological excavation of the ancient Essene community near Qumran resulted in the discovery of the Dead Sea Scrolls. Today Rose will see the excavation site and the stark natural beauty of Qumran National Park. Everybody has to swim in the Dead Sea. After she wades into the water, Rose will crack open her Bible to one of her favorite passages, Ezekiel 47. She also hopes to visit the Inn of the Good Samaritan. Today Rose will see the house of Martha and Mary in Bethany, as well as the tomb of Lazarus. Rose will take time for prayer here, sitting at the feet of Jesus, attempting to choose the better part. Today Rose heads to the ancient city of Jericho, where she'll first see the Monastery of St. George, a group of caves on the side of a cliff where hermits have prayed since the 5th century. She'll also see the Monastery of the Temptation of Jesus, another site of prayer for cliff dwelling hermits in the place where Jesus was tempted by the devil during his 40-day fast. This time, when Rose heads to Jerusalem she's going to stay awhile in the Old City. There are so many things for her to see, including the Mount of Olives, Mount Zion, Gethsemane, Via Dolorosa, and the Church of the Holy Sepulchre. We all know what July 16th is, right? The Feast of Our Lady of Mount Carmel, obviously. So where do you think Rose is going today? She’ll take time for prayer at the Stella Maris Monastery and listen for a still small voice at the cave of Elijah. In the gospel, Jesus gives us eight beatitudes. Naturally, if someone is going to do an eight-day Ignatian retreat in the Holy Land, the Mount of the Beatitudes is a pretty great place to spend it. Please pray for Rose as she makes this silent retreat. The tiny Greek island of Patmos only boasts of one saint, but he's a pretty important one, and one of Rose’s favorites. St. John wrote his book of Revelation here, so this is what Rose will be reading all day! The ancient city of Ephesus was the site of one of the earliest Christian churches, the home of the Blessed Virgin Mary and St. John the Evangelist after the death of Jesus. Rose is looking forward to praying at the tomb of St. John and exploring the ancient ruins. As Rose was looking for flights home, she finagled an inexpensive pit stop to Guadalupe. The Mother of God was given in a special way to the peoples of North America when she appeared to Juan Diego near Mexico City. This is Rose’s first pilgrimage to a Marian apparition site. After spending some time visiting family and friends back in the States, Rose will at last return to her beloved St. Paul. There's no place like home!